"Car Guy" or "Car Girl" joins car detailing forum reads, asks questions, increases their knowledge. Purchases products, often times moves up to machine polishing because clear coats are too hard and too time consuming to work on by hand. Sees first-hand, phenomenal results from their new found knowledge, skills and abilities. Starts a part-time detailing business. Makes the mistake of offering "Show Car Detailing" to a customer base that knowingly, or unknowingly wants and will only pay for "Production Detailing". The point is, for most people just starting out the majority of your customers are going to be people with daily drivers and this demographic group are primarily interested in having a shiny car, black tires, clear windows and a vacuumed interior. They won't appreciate a 100% swirl-free finish and generally won't want to pay for it and also won't know how to maintain a swirl free finish after you with all your hard work create these types of results. And here's why... the above is a multiple-step approach, it will take you more time than doing a one-step and in most cases you won't be able to charge your demographic market enough money to make enough profit to make it worth your time AND be enjoyable. Working for free is a fast way to take all the fun out of a hobby that's turning into a business. Instead when first starting out you should be doing a one-step processes or one-step detail jobs. This is what's called a One-Step Process, it's actually 3 steps but washing and claying are accepted normal procedures in this day and age for detailing cars whether you're doing Show Car Detailing or Production Detailing. If you want to do show car work, that is a multiple step processes, then I would recommend to first evaluate your customer and make sure you're matching your services at a profitable price point to customers that actually want show care results. Don't do show car detailing for someone that is going to run the car through a car wash as a normal maintenance procedure. It won't be good for you and it won't be good for your potential customer. You should target show car work to people that will appreciate your hard work and that will appreciate the results as well as be knowledgeable enough to understand that clear coat paints are scratch-sensitive and require proper care to stay swirl free. 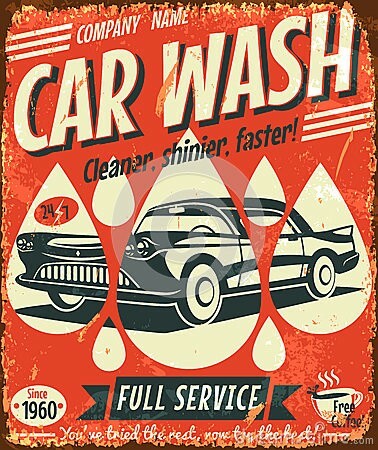 Since the majority of people that will pay to have their car washed and waxed, (so they don't have to do it themselves), will fall into people that own Daily Drivers, and this larger target market will fall into the category of Production Detailing or in other words, doing one-step procedures to the paint. The general goal of this type of work isn't to remove ALL the swirls, but to simply make the paint shiny again. Most people don't know what swirls are, they see paint that is either shiny or it's not shiny. 1. Wash and dry car to remove loose surface dirt. 2. Use detailing clay to remove above surface bonded contaminants and restore smoothness to the paint. This is key because gloss comes from smoothness and restored gloss is a powerful visible before-and-after result that your customer will notice. 3. Use a quality one-step cleaner/wax to clean, polish and protect the paint. A quality cleaner/wax will remove surface oxidation, staining and minor surface imperfections. S cleaner/waxes will even remove and/or reduce minor or shallow swirls and scratches. A quality cleaner/wax or cleaner/paint sealant will restore clarity to clear coats and increase shine. Again, these are dramatic before-and-after visible differences that your customer will notice and appreciate. And just to add, claying the paint with detailing clay also enables your choice of wax or paint sealant to bond better to the paint thus last longer and thus protect longer. These are benefits your customer wants but may not understand very well the reasons why claying helps wax to last longer so this is where you have the opportunity to educate them and set yourself apart from the average detailer with your knowledge. 4. Apply some tire dressing to restore a deep, dark black appearance to the tires, clean the windows, vacuum and clean the interior and make sure it smells clean with a fresh scent and that's your basic service package and for the majority of car owners that's what they want, knowingly or unknowingly. When first starting out, try to keep things simple, for example offer 4 plans each with it's own price point. Also offer a Monthly Maintenance Program with monthly billing. For an agreed price, once a week or twice a month or even once a month provide one of your services to maintain your customer's car so it always looks great. Once you do the initial detail maintaining their car into the future will be fast and easy and by setting them up on a regular schedule with monthly billing you will insure a consistent income at the beginning of each month for your business. Most of the detailers I know that have been successful offer monthly maintenance programs and make this the focus of their business. Keep it simple so you keep if fast and always be prepared to pick up a new customer at the location you do the work. For both of the above you will also include vacuuming and cleaning the windows but keep in mind, after the initial detail where you do the brunt of the work, these follow-up maintenance sessions will be very fast and easy. What your customer will appreciate is that there car is meticulously clean each time the see it and all the time they are in it, and a lot of professionals in any industry appreciate this kind of luxury and are willing to pay to have someone else maintain their vehicle. Go for the show car work if that's what you're interested in but target the Corvette owner, BMW, Lexus, Cadillac or any owner of what you think of as "Special Interest" cars. Keep in mind that what you think is "Special Interest" may not be the same as your customer, so be sensitive to other's preferences. For example, I'm not trying to pick on PT Cruiser owners but just as an example, some people would view these cars as just a normal car while the owner may view their PT Cruiser as a "Special Interest Car" and marketing a multi-step process to an owner that will appreciate and take care of your hard work can be a profitable win/win deal. Of course, show car detailing requires more skill and experience than most people just starting out have so don't run before you can walk. If you're just starting out get experience doing production detailing on daily drivers and continue gaining knowledge by reading discussion forums like AutogeekOnline.net and try to attend as many detailing classes as you can, always be open to learning about new products and procedures, this is something I practice myself. Also, look at the websites of some of our regular pro detailers, (that have websites listing their services), to get an idea of what they charge for their packages. Don't try to re-invent the wheel but also don't copy other people's work word for word. Any recommendations for quality one steps? Another great article Mike, thanks for sharing. "Challenge yourself to live a better tomorrow than you did yesterday"
Its not easy to get the owner to dish out the money to have it maintained. awesome info and great article. I was wondering though too, what about insurance? what if by chance something happens to a customers car while in your hands? something small or big. Blue 05 TSX-Aspec kit, Aspec suspension, blue LED interior conversion, USAspec Ipod adaptor, 18' silver G-game wolf 77 wrapped in Falken 452's, Mugen grill, PIAA fogs, high beams and reverse lights. It's going to depend a lot on their profession, lifestyle, and priorities... but I do agree it is a challenge and a person would want to target upper income demographic segments of the market. Doctors, Lawyers, top Real-Estate Agents comes to mind because they often take clients along in their cars when showing properties... in this economy a person will really have to work at this aspect of their business. Insurance - Business owners what do you pay for insurance per year? Insurance - Insurance Questions? Need help! Insurance - Cost of Insurance? Question about Tax Deductions for detailing? Questions about getting a business license to detail cars? Great info as always Mike! I've got a question, what exactly do you consider me to be? I don't aim for specific car crowds (average folks, car enthusiasts, exotic car owners). 1. Ask what the potential customer is looking for (defect free, "better than before", or just shiny). Complete interior detail and engine detail are available @ extra charge. sorry for the long post, hope to see your reply soon!